Importantly, an essential element of Lao culture is that when guests are present, a meal is always a feast, with enough food for twice the amount of diners. Not having enough food for guests would be humiliating for a host. No problem there! The beauty of these dishes was that whilst they needed a bit of prep time for chopping everything up, they were very easy to throw together when it was time to eat them, which meant we didn’t have to spend three hours in the kitchen, leaving our guest alone in the dining room, a la My Kitchen Rules. So, a feast was perfectly doable. 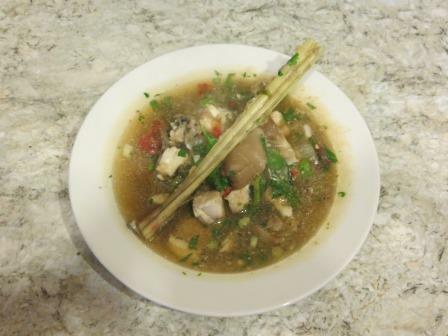 Recipe from ThaiFoodMaster – but it is a Lao dish! 1. 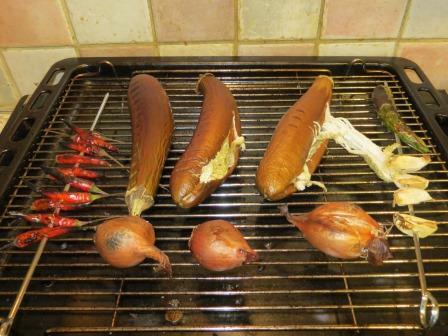 Grill the eggplants, garlic, banana chilli, bird’s eye chillies and shallots on a BBQ or in the oven. 3. Peel the garlic, shallots and banana chilli and put them, along with the bird’s eye chillies and 1 tsp salt, into a mortar. Pound together to a rough consistency. Add the eggplant flesh and pound all together into a paste. 4. Put water in a pot over a high heat. Bruise the lemongrass stalks and add them to the pot, followed by 1 tsp salt (we scaled this down a bit to avoid it being too salty) and the fish sauce. 5. Bring the water to a strong boil, then add the fish (avoiding stirring) and mushrooms. Let the soup boil until the mushrooms and fish are done, then add the eggplant/chilli paste and stir well. 6. Turn off the heat before adding the spring onions, coriander and lemon basil. We weren’t joking before when we said this one would blow your head off. Bird’s eye chillies aren’t exactly mild and they certainly made their presence known in this soup. Having said that, the flavours were delicious and perfectly balanced, and it did taste authentic! We did have to run for the tissues before thinking about the main course, though… but we would make it again. We might just cut down on chilli quantity. Just a bit. Oddly enough, the most popular recipe for this online seems to be from a place called the Queen Mother Café in Toronto. This doesn’t automatically scream ‘AUTHENTIC’, but it was raved about on so many different websites, we went for it. Turns out they weren’t wrong. This specific recipe comes from Milk & Honey. 1. First, make the marinade. 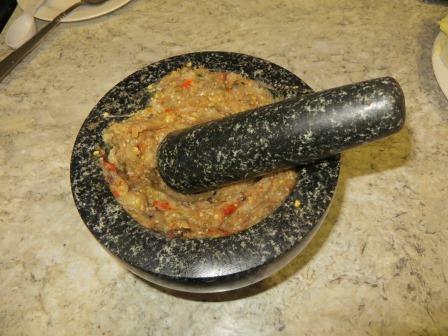 Blitz the coriander, garlic and peppercorns in a food processor until finely chopped. 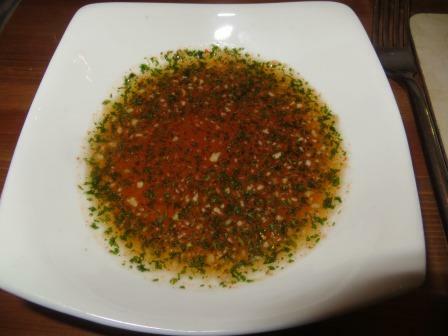 Add the oyster sauce, fish sauce and vegetable oil and process until combined. 2. Cover the chicken all over with the marinade, cover with cling film and refrigerate for as long as possible (at least one hour – we did about seven). 3. For the dipping sauce, combine the water and sugar in a saucepan and bring to the boil over medium heat, stirring until the sugar is dissolved. Continue cooking for 10 minutes or so until reduced and syrupy. Cool completely. When cooled, add to food processor with all of the other ingredients and process until smooth(ish). 4. 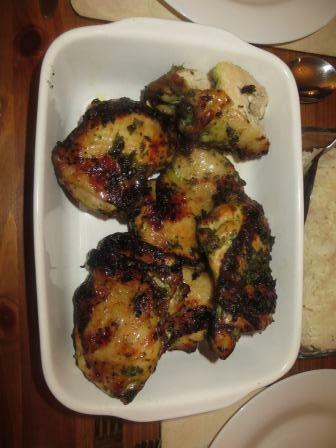 When the chicken is ready, cook on a BBQ or under a grill until cooked through and looking all nice and charred. These were the original recipe quantities. We approximately halved the amount of meat to serve 3, but then forgot about that when making the marinade and dipping sauce, so we had too much of those, but no one was complaining. For such a simple dish, this was delicious: really flavoursome, and the chicken and dipping sauce were a perfect combination. The blog we got the recipe from said that the temptation to drink the dipping sauce out of the bowl would present itself. There may be some truth in this. Definitely one to make again, especially now BBQ season seems to be nearly upon us. 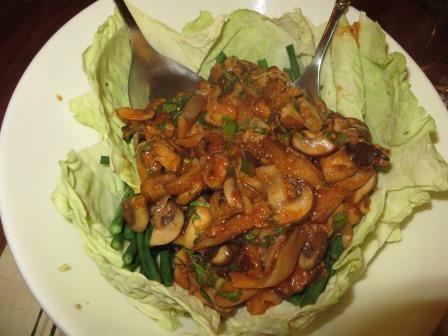 Although this would more commonly be made with meat, we didn’t really think pork salad really worked as an accompaniment to grilled chicken, so we found this mushroom version. Again, it does come from a Thai website – Marion’s Thailand – but it is widely known that this is the national dish of Laos. 1. Heat the rice in a wok over a high heat, stirring often until dark golden brown. When cool, grind to a powder in a food processor (or mortar and pestle). 2. Heat the oil in a wok over a high heat. 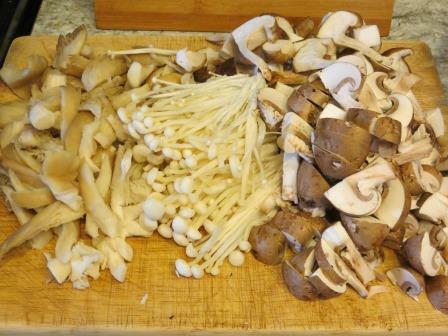 Add all the mushrooms and stir fry them for about 2 minutes or until they just start to collapse. Remove from the heat and toss through everything else. 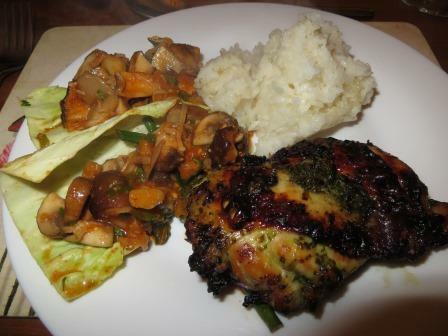 Serve with cabbage leaves and snake beans. Again: delicious! In fact, having bought Croydon out of mushrooms we now have a kitchen full of them, so we’re planning to make it again tonight to eat with pork chops (and the leftover dipping sauce from the ping gai!). The only thing requiring any effort in this recipe was cutting up all the mushrooms. Otherwise, you basically throw everything in a wok and the flavours do the work for you. 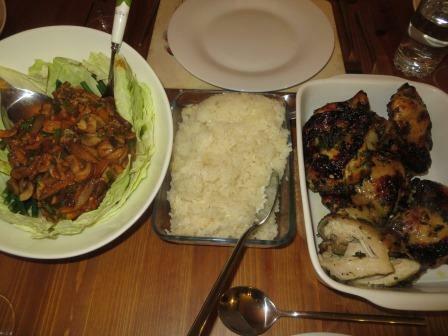 As mentioned, we served the ping gai and larb with sticky rice and followed it with a South-East Asian-inspired fruit crumble, and we think it made a well-rounded meal and (hopefully) a nice send-off for a good friend. We already knew we liked South-East Asian food so were probably coming into this at an advantage, but we’re really looking forward to what the next few weeks bring us as we work our way through neighbouring countries. It’s also (once again) very well-timed, with summer being upon us (apparently). So bon voyage, Wendy – safe travels, and we’ll see you on the other side of the world. And as for this blog: see you next time for something Vietnamese! This entry was posted in Cooking, Dinner, Fish, Food, Meat, Vegetarian and tagged chicken, cooking, fish, food, Lao food, Laos, vegetarian by mash29. Bookmark the permalink. A wonderful (& memorable) send off! I shall have to make this when I get home too – the flavours were amazing (even the chilli)!! Thank you so much for opening your home and your kitchen on multiple occasions. Looking forward to seeing you both next in Aus! This is all so adventurous to me! Thanks for sharing!